McGraw-Hill Workforce's Career Companion series provides up to date career information and contextualized skill practice to help learners succeed in the 21st century workforce. 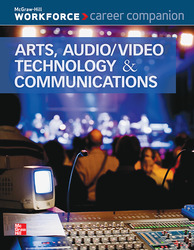 Arts, Audio/Visual Technology, and Communications introduces readers to this career cluster by exploring career pathways and jobs within the arts, audio/visual technology, and communications fields, education and training requirements, work environments, and current industry trends. Preparation for career readiness and success is provided through applied workplace skills practice using real-world scenarios set in the industry. This special value pack includes 10 copies.